I don’t claim that this is what other folks should necessarily be doing; for instance, I work in the tech industry, where (despite your claim) there actually are benefits to countersignalling disinterest in fashion, because tech is sometimes perceived as infested with brogrammers playing status games instead of trying to write good code. Clearly this countersignal is not appropriate for everyone. But similarly, the outfit on the right would clearly mark the guy as Not Our Kind of People to lots of folks outside the preppily-educated general-competence-valuing upper middle class. Clothes can optimize lots of different things. Projecting competence is one of them, but so is freeing up time/attention/money, being authentic, countersignalling, being artistic, fitting in, etc. Also, yes, perhaps I framed this too narrowly. Elsewhere I’ve made the point that “dressing well” depends strongly on your audience. I’ve edited to reflect that more. I didn’t know about the counter signaling wrt the Bay Area, so thanks. The Seattle tech scene doesn’t seem to have that issue. 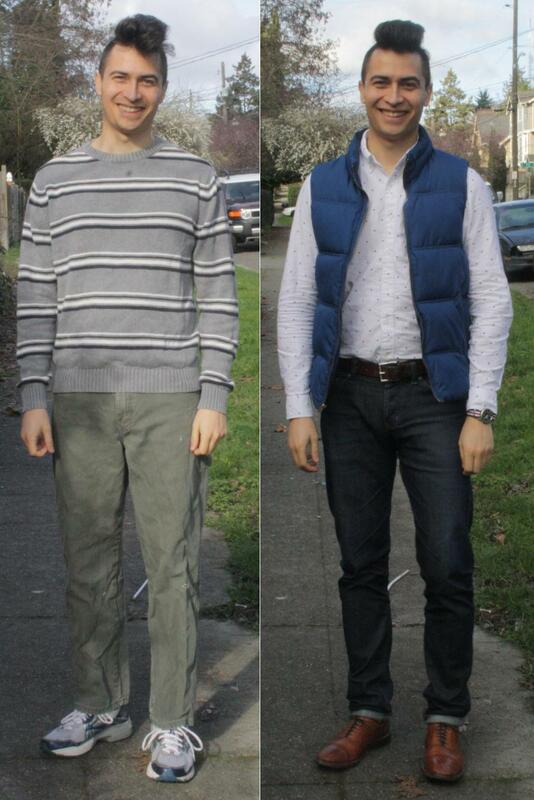 As a PhD student in CS, I think the guy on the right dresses just plain weird, and the guy on the left dresses like the highly competent computer scientists I meet on a daily basis. I might be wrong about the phd thing, many of the academics I have met are well dressed, but many of the ones I’ve met were from NYC which would skew things. Honestly, I’m so distracted by the hairstyle that the clothes are hard for me to even notice. As Ben and Jessica point out, what makes a person look competent varies quite a bit by group. The 80s jacket and punk hairstyle turned me off immediately, and guy on the left is simply dressed in casual clothes, albeit not the nicest ever (and has a weird punk haircut). Guy on the right looks immediately like a douche, honestly. I think getting to guy on the left levels of fashion is important, and further improvement depends on who you’re around.